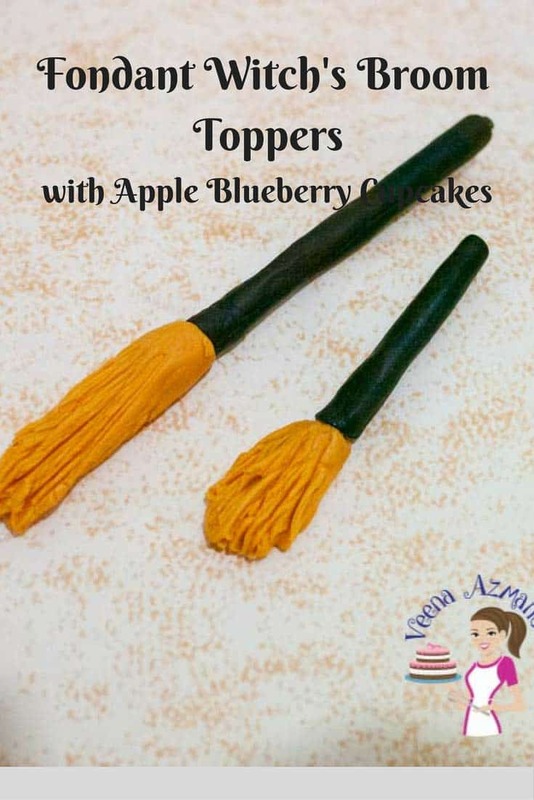 This Witch’s Boom Cupcake Topper are fun and easy to make that all kids or grown up would love to have on their cupcake or cake. Barely take five minutes to create with just a small piece of fondant no special equipment needed. How cute are these? You can use them on cakes too. So it’s basically a cake or a cupcake topper. The only difference of course is you make the ones for the cake a tad bigger than the cupcake. I have shown you both in the video below. Here is the close of the Brooms. The larger one can be made into a Cake topper while the smaller one would be a Cupcake toppers. I showed you both in the video just so you can see it better on the larger one. I made these for a birthday girl recently. She loves Halloween so her request was to make Halloween cupcakes with her friends. So of course I chose to make the ones that kids would love the most… Witch’s Hat, Broom, Boots, Cauldron, Pumpkins, Skull and Bones, ghost. The kids really loved it. The dad when one step ahead and created a spooky atmosphere. Unfortunately she didn’t want me to share any of the party pictures on my blog. I totally appreciate that. I have kids too! 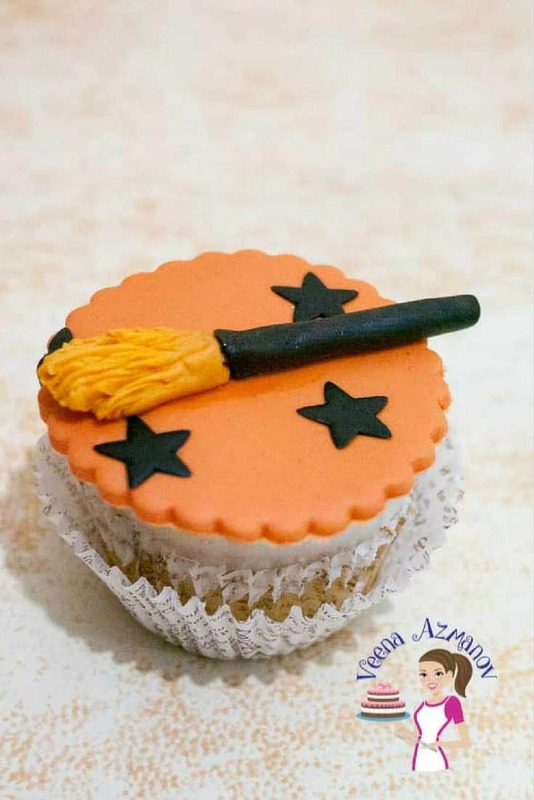 We kept to some simple fall inspired cupcake recipes which I have shared before with you. Some Apple Blueberry Cupcakes, some were Pumpkin Spice Apple Cupcakes and some like these are my Scrumptious Brown Butter Cupcakes. The recipe card is below for you convenience. Here is the video I made showing you how I to make the Brooms. You can find all six videos on my You tube Channel here.. If you have not subscribed yet.. 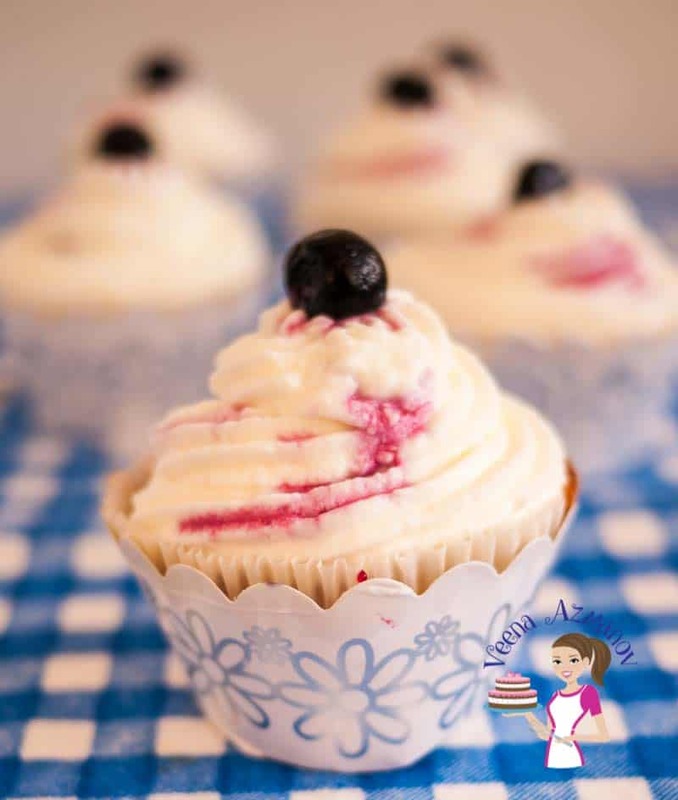 The sweet apple flavor and the tart blueberry filling of these apple blueberry cupcakes are what really makes these cupcakes exceptional. A light and fluffy brown sugar vanilla batter with cinnamon flavored apples give these cupcakes a caramel-like sweetness. Preheat the oven to 160 C / 320 F.
Line your muffin pan with cupcake wrappers. Core, peel and chop apples into small thin almost minced pieces (I like them to almost dissolve in the batter). Combine together sour cream and apples. Swift together - flour, baking powder, baking soda, cinnamon & salt. Alternate the flour mix and sour cream/apple mix into the mixer. Once all the ingredients are in. Scrape the sides of the bowl and give it another mix on medium for 30 secs until a smooth batter is achieved. Divide batter into the cupcake wrappers about 3/4 full. Bake in a preheated oven at 160 C / 320 F for about 18 to 20 mins. Cool completely before you decorate. In a sauce pan - add blueberries, sugar and lemon juice. In a separate bowl - add cornstarch to 3 tbsp water or use some of the blueberry juice. Place blueberry pan on medium heat until all the sugar is dissolved. add the cornstarch slurry - cook on low until thickened. Continue to mix adding powder sugar one cup at a time. Mix well with each addition so you have a nice light and fluffy whipped cream like consistency. Once you have between soft to firm peaks good for piping - you can stop. Use in a piping bag with a star tip. Once the cupcakes are cooled. Core out the center with an apple corer. 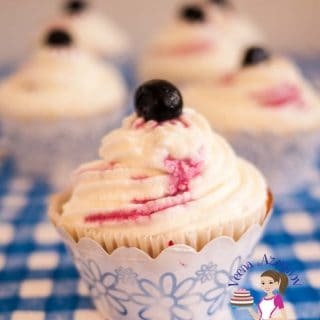 Place a teaspoon of blueberry filling in the center. Pipe with cream cheese frosting (as shown in the video above). 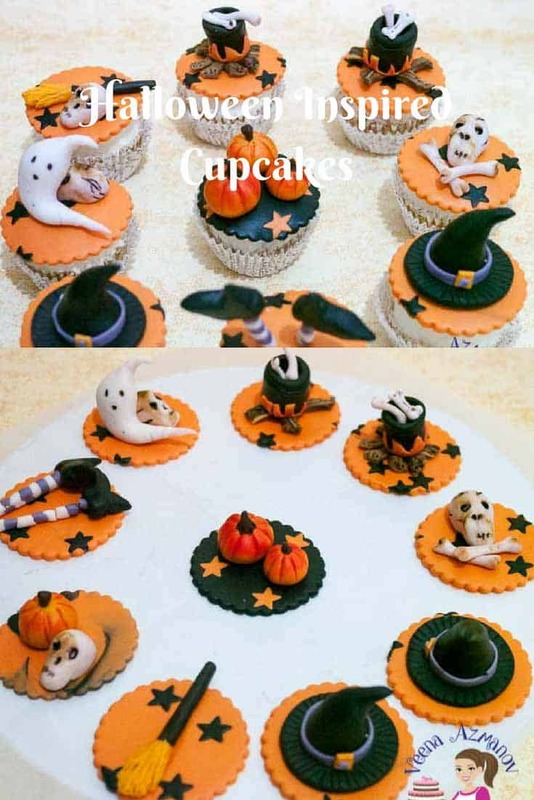 Don’t Forget to check out the rest of the Halloween Inspired Cupcake Toppers. Yes I always use cmc or tylose powder in the fondant before I make figures. THanks, Sunita. 1 tsp in 250 grams of fondant is a good measure. Thank you Anita. Happy to hear this tutorial was useful. Thanks I’m sure the kids enjoyed it. They love Halloween stuff. Thanks for coming back to write this feedback. Appreciate it very much.